Askbot is an commercial open source question and answer platform. StackOverflow and YahooAnswer were the inspiration for Askbot, and it has the same features like karma points, up votes and down votes. AskBot launched in 2009 and its used by LibreOffice, Fedora, Ros.org, Sage and other, for their Q&A sections. It written in Python on top of the Django platform, and in this tutorial we’ll show you how to install, configure and run AskBot and deploy with NGINX as a web server, PostgreSQL as a database server, and LetsEncrypt as a free SSL certificates provider on your Ubuntu 16.04 server. Let’s get started with the tutorial, and if you carefully follow the steps bellow you should have AskBot installed on Ubuntu 16.04 in less then 10 minutes. Save and exit. You should restart the PostgreSQL service in order to enable automatic start at system boot and at the same time to enable these changes. Create a new PostgreSQL database and user for Askbot installation. In this tutorial, a new database ‘askbot_db’ with username ‘askbot_user’ and password ‘YOUR_PASSWORD’ was created. You need to login as the postgres user and access the PostgreSQL shell ‘psql’. Using the next queries you should create a new database named ‘askbot_db’ and a new user ‘askbot_user’ with password ‘YOUR_PASSWORD’. Now, you have created a new PostgreSQL database for Askbot installation. You have installed all packages which are needed for the installation of Askbot and also you have created the PostgreSQL database. The next thing on your list is to install and configure Askbot. 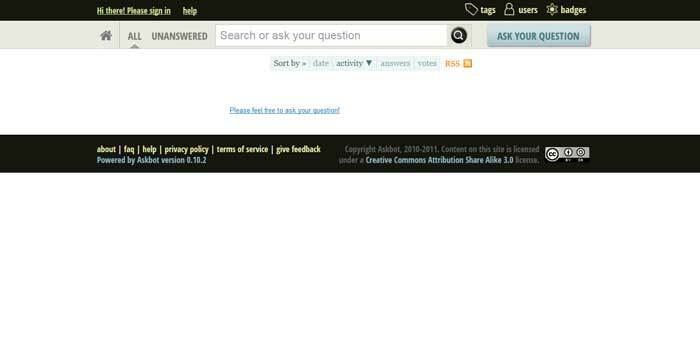 Now, for the installation of Askbot a new user should be created, because the root user won`t be uses for it. You need to create a new user ‘askbot‘ and to give a new password to that user. Then, you should add the askbot user to the sudo group by the usermod command. You have created a new user has been created. The next step is to update python-pip and install virtualenv package. Using the following pip commands you can install these packages. At this point you should log in as the ‘askbot’ user with the su command, and install Askbot. Next we would need a new virtual environment for the installation of askbot and we can create it with virtualenv command. Next you should install Askbot Django app with pip, including psycopg2 for PostgreSQL database connection. Now, you need to create a new directory for Askbot Django app – we choose to use the name ‘my_app’. You should install Askbot in the created directory. You should only give the single ‘.‘ and press ‘Enter’ when asked about the Askbot installation directory. In a similar way, by choosing number ‘1‘ you can choose PostgreSQL for database config. Input the database name ‘askbot_db‘, username ‘askbot_user‘ with password ‘YOUR_PASSWORD‘. Using this command you will generate Django static files directory. In order to continue type ‘yes’ and press Enter. With the use of the syncdb option you can generate the PostgreSQL database. You should type ‘yes’ and then type your admin user, email, and password when asked to create the admin user. Now you have installed Askbot on the system under the ‘askbot’ user virtual environment. If you want to test the installation of Askbot you can run the runserver command below. If you desire to check the Askbot’ page you need to open your web browser and type the server IP with port 8080.
uWSGI supports applications based on Python, Perl, and Ruby. Here, we are going to use uWSGI with the Nginx web server for our Askbot installation. You can install uWSGI using the pip command below. The next step is the creation of a new directory for the uWSGI site configuration ‘/etc/uwsgi/sites’. You need to add new uWSGI configuration file ‘askbot.ini’ to the ‘sites’ directory and then to edit it with nano. There, paste the following uWSGI configuration. You have now installed Askbot and it’s running under the uWSGI sock file ‘askbot.sock’. At this point, we are going to use Nginx web server as a reverse proxy for uWSGI application Askbot. Using the apt command below you can install Nginx from the repository. Now, using the pip command below, you can install LetsEncrypt. Once you have completed the installation, don`t forget to add new nginx virtual host file ‘askbot.conf’. You need to paste the following askbot nginx virtual host configuration. Next, with the creation of a symlink for ‘askbot’ file to ‘sites-enabled’ directory you will enable the Askbot virtual host file. That’s it, you have successfully installed Nginx web server and configured for the Askbot Python Django app. Of course, you don’t have to install, configure and run Askbot on Ubuntu 16.04, if you use one of our outsourced Linux server support services in which case you can simply ask our expert Linux admins to install and configure Askbot on Ubuntu 16.04 for you. They are available 24×7 and will take care of your request immediately. PS. 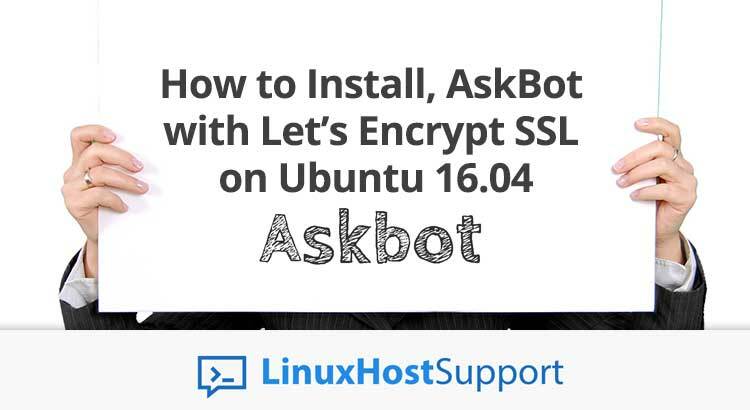 If you liked this post on how to install, configure and run AskBot with Let’s Encrypt SSL on Ubuntu 16.04, please share it with your friends on the social networks using the buttons on the left or simply leave a reply below. Thanks.